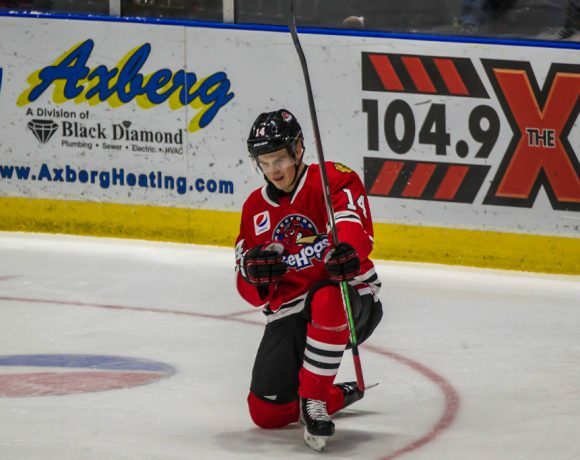 There were many new faces at forward for the Rockford IceHogs in the 2017-18 season. On a roster that went through some changes in the latter half of the campaign, there was a lot to cover in this area. I’ve previously cast a magnifying glass on the goalies and defensemen in recent posts. For now, let’s move forward with the forwards from Rockford’s big season. Rockford’s rookie of the year was the big story throughout the first half of the season. Highmore epitomized the fast-paced style Colliton emphasized, with 15 points (9 G, 6 A) in his first 21 games. His nose for the net resulted in Highmore pacing the team in goals. An appearance at the AHL All-Star Classic, coupled with a spring call-up to the Hawks made for a memorable first-year of pro hockey for the free-agent signing. Highmore is definitely in the mix of prospects who could find themselves in Chicago in the coming years. Like a lot of the prospects, Highmore’s numbers dipped just a bit with the veteran influx in February. By the playoffs, he was skating on one of the lower lines while still playing solid hockey. In 13 postseason games, he was a plus-eight to go with a pair of goals and seven helpers. Louis was Rockford’s point leader (44) in the regular season, though the addition of the veterans had a big effect on his game down the stretch. To say his role was diminished is probably an understatement. Skating a little lower in the Hogs lineup, Louis still managed 14 points (5 G, 9 A) in the last two months of action. However, the physical nature of the playoffs seemed to take a toll on his effectiveness. After five assists in 9 games, Colliton sat Louis in favor of Samuelsson three games into the conference final. Louis is a strong passer and can flourish with linemates who can finish the chances he creates. I think he’ll be a player to watch as he makes the adjustments to raise his game in his sophomore campaign. Based on the expectations of a player who had such a strong training camp in 2016 before being sent back to juniors, Fortin was an under-performer in his first season with the IceHogs. To be fair, he missed a couple weeks in January and three more in March due to injury. His speed was often on display, though there were many instances of Fortin streaking out of control and committing turnovers. A shooting percentage of 4.3 did him no favors; finishing scoring plays and playing under control should be at the top of Fortin’s list of improvements heading into next season. The real head-scratcher among the piglets. Iacopelli brought offense, scoring 20 goals between Rockford and Indy, where he had nine in ten games for the Fuel. He is arguably the best sniper the IceHogs had this season. So…why couldn’t he find a place in the lineup? With someone to get him the puck, coupled with a net hound who can convert on rebound opportunities, Iacopelli could be a dangerous AHL forward. He is going to have to improve on his skating as well as find a way to create space for his shot. The question will be if he can do that at age 24. Iacopelli often found himself on the bottom line with players more suited for checking roles. He’s not that type of player right now. Hopefully he got a list of things to work on this summer. If he can carve out a steady spot on a scoring line, we could see big numbers out of Iacopelli. There isn’t much offense to Knott’s game. He had three separate 11-game pointless streaks while skating fourth line minutes and killing penalties. In his final 38 games this past season, he had three goals and no apples. Knott held down the fourth line through the regular season; he did not appear in the playoffs for Rockford. On the other hand, he was a frequent winner of the Schnucks Grand Prix over speedier teammates Alexandre Fortin and William Pelletier. Knott is still just 21 and has two more years on his entry deal to develop at both ends of the ice. With most of the new faces coming in on defense, he may still have the spot in the lineup to do so next fall. Noel really deserves a redo button; his season never really got on track after being injured in training camp. By the time he was set to return, there was no spot in Rockford to be had. Noel went to Indy, where he played 17 games before getting hurt and missing a couple of months. He was brought up to Rockford in mid-February and had limited chances to develop into the IceHogs agitator. Until Chris DiDomenico arrived, that job was up for grabs. A healthy Noel might have run with that role. My interest was peaked in the short stint Noel was with the IceHogs. Finishing the regular season with the Fuel, Noel played well in Indy’s short playoff appearance. If Noel is in game shape to start 2018-19, he may be able to find his niche. These players, Hinostroza in particular, carried Rockford in the first couple of months. 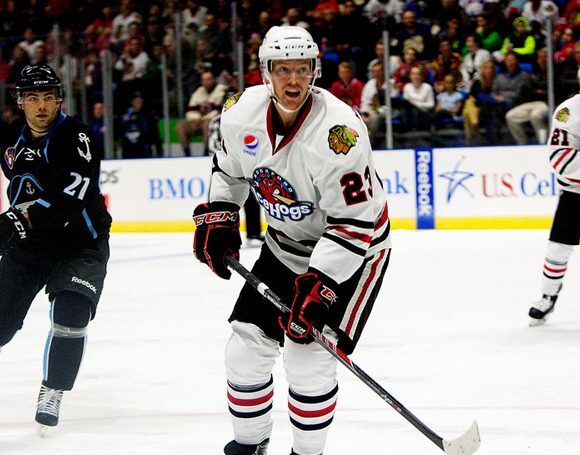 Hinostroza was recalled by the Hawks December 8, Kampf on December 27 and Jurco on January 8. Kampf returned in April to finish up the season and playoffs for the Hogs. In 16 games, he managed just a goal (Game Five vs Texas) and two assists (in Chicago in the last game of the regular season). Dauphin, who played with a full face shield following a altercation in San Antonio December 15, was traded back to Arizona in the Anthony Duclair deal. Adam Clendening came to Rockford was a key part of the spring resurgence; Dauphin played 17 games for Tuscon (5 G, 10 A) before being recalled to the Coyotes. He was injured blocking a shot March 11 and missed the rest of the season. All this guy did was spark Rockford into its late-season push to the Calder Cup Playoffs. Once there, he was the league’s top point producer (7 G, 11 A in 13 games) until the final games of the Calder Cup Final. If anybody saw this coming, step forward and be called Fibber McGee. Returning to AHL rinks after several seasons abroad, DiDomenico was obtained for Ville Pokka in a trade with Ottawa in mid-February. Along with a heavy dose of veteran leadership that was injected into the piglets, DiDomenico brought a chippy element to a club that had practically none before he arrived. By the time the playoffs started, you had skaters of all shapes and sizes finishing checks all over the ice. The motor was still firing, but the Hogs picked up a definite snarl that was a major part of the playoff success. DiDomenico rides off into the sunset, having signed to play in the Swiss League for two seasons soon after cleaning out his locker at the BMO. One richly deserved stick tap, coming right up. 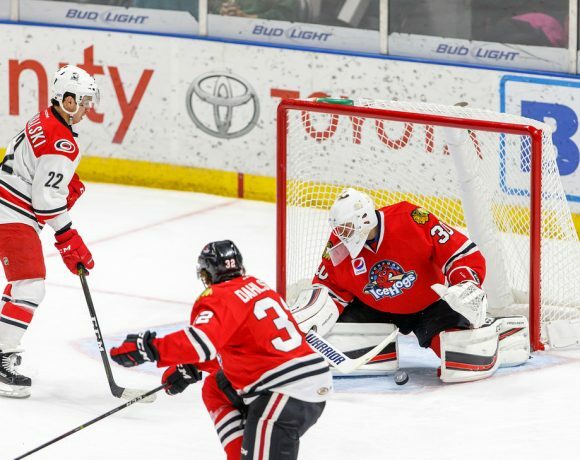 Chicago sending the physical forward to Rockford in February proved to be good for the IceHogs. Like DiDomenico, Bouma added veteran grit that was in short supply at that point of the campaign. Like DiDomenico, I would not expect to see Bouma in a Hogs sweater next season. I’m finding out about the Hawks trade with Vancouver just as I was set to ponder Kero’s season for this post. Basically, Kero’s 2017-18 season has produced Michael Chaput. Kero came to Rockford in December. He was out for about a month after an injury against San Antonio on February 18 and also missed a few games at the close of the regular season. Arrived January 10 when he was assigned to the Hogs by Chicago, playing through the beginning of March before being recalled. Hayden was also with Rockford once the Blackhawks season ended. Hayden was physical for sure…but he just didn’t seem to make the impact I imagined when he was sent to Rockford. That goes double in the playoffs; he delivered his share of hits but accounted for just three goals in 13 postseason games. The former first-round selection of the Coyotes was skating in the ECHL for Idaho when Rockford inked him to a PTO in February. The move became a permanent arrangement when the IceHogs signed him through the 2018-19 season. Samuelsson found the net in each of his first three games with Rockford, including a game-winner against San Antonio February 18. He worked his way onto a power play unit and was a steady presence through the rest of the regular season. Samuelsson showcased some offensive know-how to go with a strong presence in the corners in his stint with the Hogs. After sitting out the first two rounds of the postseason, he was inserted for the last four games of the conference final with Texas. Ejdsell, of course, made his mark in the postseason, where he totaled 12 points (7 G, 5 A) in 13 games. The lanky forward displayed a nice shot and enough skating ability to keep up with his linemates. He certainly didn’t look out of place in the smaller North American rinks. The 23-year old Swede had a good sense of timing. Four of his postseason goals were game-winners, the most notable being the one that ended the Game 3 triple-overtime affair with the Wolves. Another came in an elimination game with Texas, where he had a three-point Game 4. A full season in Rockford could prove to be very interesting, as Ejdsell could probably use a year to hone his skating before hitting NHL ice. Depending on the makeup of the Hawks roster, he could see himself riding the I-90 shuttle for parts of next season. So far as early season veteran presence, Martinsen was about it through the first months, save for Jurco and Dauphin. The big Norwegian was key to any physical element to the piglet’s game until the latter part of February when guys like DiDomenico and Bouma showed up. Obtained for Kyle Baun just before the start of the season, this trade was a definite win for the Blackhawks. Baun wasn’t terrible this season, with 22 points (5 G, 17 A) in Laval and the Toronto Marlies (with whom he won a Calder Cup despite not playing in the playoffs). For the IceHogs, however, Martinsen brought more to the table and was a good fit. Aside from a spell in Chicago this spring, Martinsen was a mainstay in the lineup, often teaming with Sikura and Alexandre Fortin on what proved to be a very effective group. The 6’4″, 230-pounder re-upped with the Blackhawks for 2018-19. He should be able to skate fourth-line minutes in Chicago if needed and is a nice piece for Colliton to have in Rockford. Sikura failed to stick in three AHL cities following his college career at Dartmouth. Before signing with Rockford, he was still looking for his first AHL point. This season, he earned the team MVP award and an NHL entry contract to boot. Sikura was a hard worker in the first two months of the season, but it wasn’t showing up on the scoreboard. Through November, he had three goals in 19 contests. In fact, it wasn’t until the post-Christmas part of the schedule that Sikura started seeing the fruits of his efforts. Starting on December 28 until signing his NHL contract for next season March 6, Sikura put up 13 goals and six helpers in 29 games. To celebrate his new ink, he had 14 points (7 G, 7 A) to close out the last 17 games of the regular season. Sikura proved to be quite the redirection artist throughout the season. By the spring, not only was he killing penalties but was on the red-hot first power play unit. Sikura also showed that he can create scoring chances on occasion when away from the net. This was by far the most productive season by a Hogs AHL-signing in the history of the franchise, eclipsing P.C. Labrie’s 2015-16 34-point explosion. Labrie, however, was between NHL deals at the time. Sikura truly announced his presence with authority in his rookie season. What lies ahead for the elder Sikura brother? I don’t know if he can match last season’s 18.3 shooting percentage, but he’s welcome to try. It will be interesting to see how he follows up such a remarkable performance. Another AHL rookie that kept several Hawks prospects out of the lineup was Pelletier, who came out of Division III Norwich looking to prove he could skate at this level. He did. Pelletier’s wheels allowed the Hogs to send pucks way down the ice, knowing the 5’7″ forward could negate icing and chase down the biscuit. His fore check was tenacious all season and as the playoffs got underway, he started bringing the action to his opponents along the boards. This was good to see, because Pelletier was a guy opposing teams loved to target on the ice with big hits. Dishing back a little physical business didn’t hurt his effectiveness. Pelletier earned an extension of his AHL deal with Rockford for his efforts and should yet again be a fun player to watch zooming up and down the ice. I’m giving Johnson his own category in this review. On a roster of first-year prospects and veteran additions, Johnson perhaps had the most to prove out of any of the returning players. In last year’s season recap, I suggested that Johnson needed to step up his game from a 17-point rookie campaign in 2016-17 to avoid being pushed to the bench by all the new faces in Rockford. I’d say that Johnson took that step and then some. Johnson was a steady producer at both ends of the ice for Rockford. He also was a player who took on some big dance partners when circumstances dictated. Four of the IceHogs league-low 11 fighting majors were attributed to Johnson. In a very quiet manner, Johnson raised his position within the organization. He drew praise from NHL veteran Cody Franson as well as with coach Jeremy Colliton. John Dietz of the Daily Herald got both men to open up about Johnson’s game during the playoffs. If Colliton names a captain for the 2018-19 IceHogs (after not doing so this past season), don’t be surprised if the C is slapped on Johnson’s sweater. These three players produced a grand total of zero points for the IceHogs this season. Wideman (13 games in Rockford) did have another good season with the ECHL’s Indy Fuel, with 16 goals and 32 assists. Most of his time in town came in January and February. Olczyk saw action once for the Hogs, skating in Grand Rapids January 20. Maksimovich was signed to an ATO in March after scoring 31 goals in the OHL for Erie. He got into four games late in the season and was inactive once the playoffs got underway. Unlike a year ago, there should be lots of returning faces up front for the Hogs. Depending on what kind of veteran skaters Rockford is afforded, there could be several players who could make big strides in their games. Like last season, it should be exciting to watch. I’m sure there will be some activity worth shouting about in the coming weeks. Follow me @JonFromi on twitter just in case I think of something. I’ll be back in a couple of weeks to sort through the summer.